The 24 Hour a Day Virtual Open House! Bring Your Visitors Back for More! Last year over 77% of home buyers used the Internet to search for their new home. With odds like that, your sale needs to have an impressive presence on the web or you could risk losing your perfect buyer to one that does. The Custom "Site Specific" 5 Day Sale Website works day and night to sell your home! There are no open house hours on the web; the site provides 24 hour-a-day access to a virtual tour of your home’s features, the bidding process, and frequently asked questions. The site is developed by professional web designers using a unique domain name specifically acquired for your property. The look and feel of the site is then based on your home's color schemes and characteristics. Buyers will browse through the quick and full tours, read legal information about your 5 Day Sale, and whet their appetite for your open house with vivid pictures and descriptions. Less time consuming questions, more bids! This is an essential addition to the 5 Day Sale marketing system, and works to kick your sale into overdrive to increase the overall results of your sale. It brings your home's marketing campaign right into the living room of your potential buyer, and they can return to your website any time, day or night—they'll fall in love with your home before they even walk in the door. Take a look at our past successful Website Packages we have put together! *Recommended for homes $60,000 to $125,000. A website with photos of your home, legal information about your sale, and a user-friendly Contact page to put interested buyers in touch with you to ask questions. Upgrade Available! 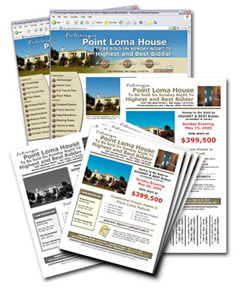 Need printed marketing materials to target the maximum amount of prospective buyers? Click to learn more on how to upgrade your "Site Specific" Website Package A to include a complete marketing blitz! Take a look at our past successful Website A packages. *Recommended for home above $125,000. 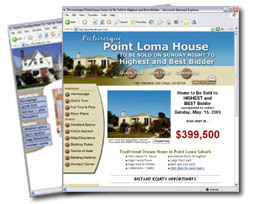 A stunning, enhanced website design that is customized to match the unique style and colors of the home you are selling. Full-color photos of your home, detailed specs about your home, legal information about your sale, and a user-friendly Contact page to put interested buyers in touch with you to ask questions. 11 complete sections on your website to give buyers an extensive knowledge base about the home you're selling and the surrounding community. Instant Web Results, updated hourly and available 24/7 to let you know how many people are visiting your website, what pages they are studying, and where they are referred from. This is a vital way to measure how many people to expect at your 5 Day Sale. Take a look at our past successful Website B packages. Buy a Website Package A and combine it with a Custom Media Packet. Buy a Website Package B and combine it with a Custom Media Packet.